In this final part of my series (part I, II and III) on reversing the dependency from Domain Model to Data Access code found in many traditional layered code bases I will show how raising Domain Events when Domain Objects are updated can further decouple the Data Access component from the other components. 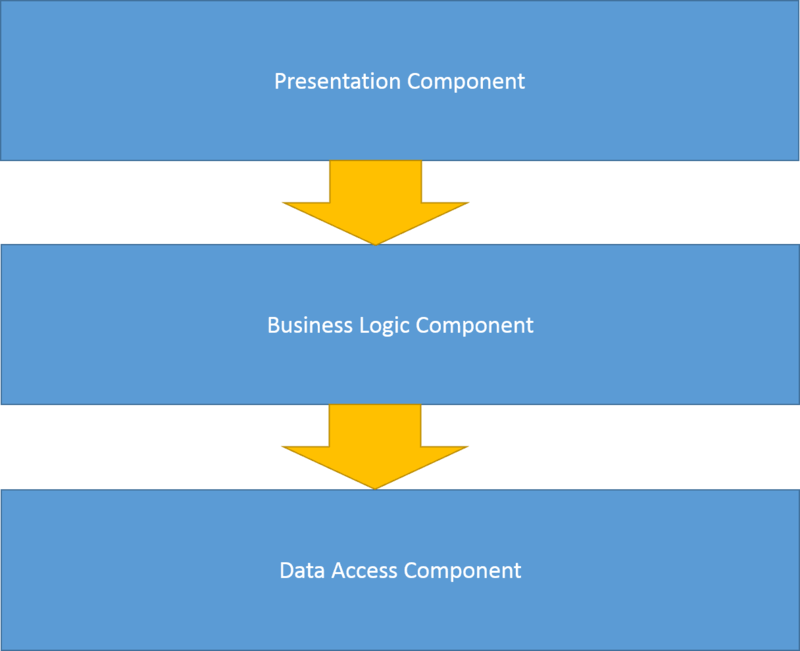 The two previous posts show how to reverse the dependency between Domain Model and Data Acces either by letting the Presentation Layer talk to the Data Access code or by invoking Dependency Inversion. This may seem innocent enough, but saving is not a presentation concern, which means presentation code should not be making that .Save call. Again this seems innocent enough, but what about the Save method? On the one hand it does not reveal anything in particular about the underlying Data Access code or database. On the other hand it does imply that WishList objects can be saved - presumably to a database of some kind. Furthermore the Domain Model has to decide when to call .Save, which is not really a Domain Model concern. The Domain Model should be responsible for the Domain logic. The 'what' and the 'how' of persistence is the responsiblity of the Data Access component. The 'when' of persistence is also the responsibility of the Data Access component in simple cases and of Infrastructure code in more complicated cases. 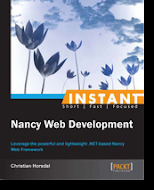 Now neither the Domain Model or the Presentation component makes any decisions about what, how or when to persist. The Presentation layer only retrieves Domain Objects as needed and interacts with them. The Domain Model just implements the Domain Logic and raises events whenever there are state changes. It is the full responsibility of the Data Access component to handle the 'what', 'how', and 'when' of persistence. It is not always good enough to simply persist state changes right away as Domain Events are raised. Sometimes a Unit Of Work is needed. In such cases the Domain Event handlers should not persist data directly, but rather interact with the Unit Of Work to record changes. Whether the Unit Of Work eventually ends up being commited or not is not the concern of the Domain Event handlers. They can rely on Infrastructure code to take care of persisting or discarding the changes recorded by the Unit of Work. and registering all Subscribers with that class in the Composistion Root. This can be done by explicitly listing all subscribers, by discovering them by scanning assemblies or in case the application uses a IoC/DI Container by asking the Container to resolve Subscribers. Rasing Domain Events further decouples the Data Access component from the rest of the components. It frees other components of the responsibility of deciding what and when to save, and it allows both for simply saving immediately and for delegating to a Unit of Work. Raising Domain Events also allows for similar deploupling of other components - e.g. integrations to third parties. This 3rd post in the series about moving from an architecture where Domain Model code depends on to Data Access code to an architecture where that dependency is reversed shows how that can be accomplished using Dependency Inversion. "Abstractions should not depend upon details. 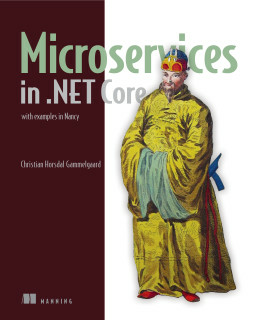 Details should depend upon abstractions"
And that inverts the dependency. 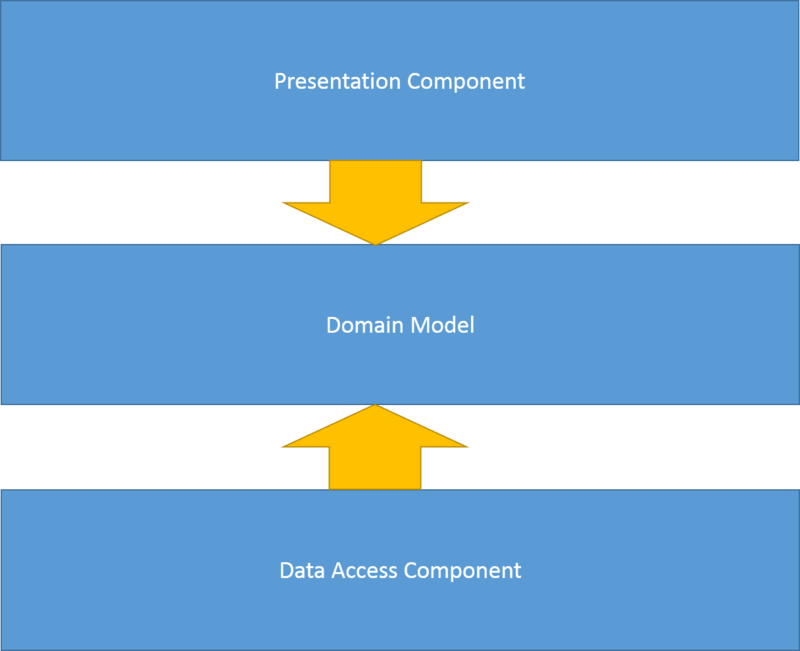 We have inverted the dependency between Domain Model and Data Access, such that the Data Access component now depends on the Domain Model, while the Domain Model has one dependency less. As a side effect the type WishListDTO disappeared, so we end with less code and a better separation of concerns. 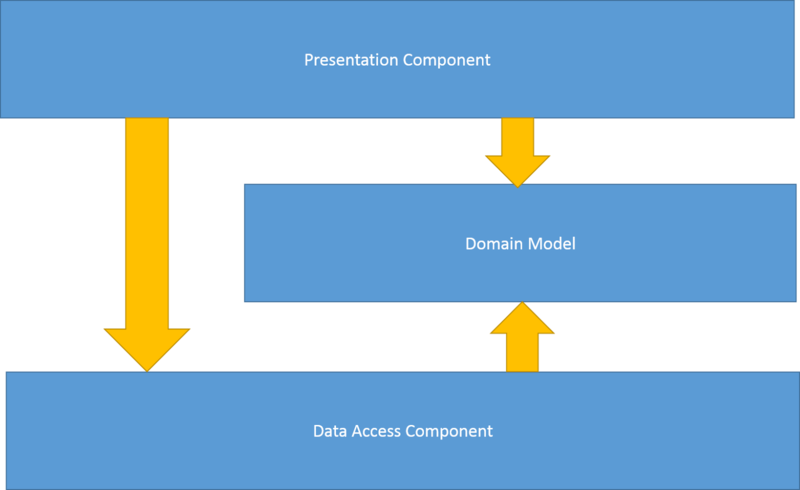 Notice that the arrow from the Data Access component to the Domain Model? Why is that there? returns a Domain object - an instance of the WishList Domain class. So there you have it: Allowing the Presentation component to talk to the Data Access component allows you to cut the dependency from Domain to Data Access, but introduces the reverse dependency. For the reasons argued in the first post (and in the resources referenced there) this a much better position to be in than the one in the top most diagram. Notice that the data access component now returns Domain objects when queried. That is possible because the dependency points from Data Access to Domain. It used to be the other way around. So ... what did the Data Acces code return on queries before? Most likely some object containing the relevant data from the data base. These types of object come under different names: WishLisDTO, WishListEntities (as in NHibernate or Entity Framework entity), DataModels etc. Regardless of the name their main purpose is to move data from the database into the layer on top of the Data Access layer (i.e. the Domain layer in the top most diagram). But now that the Data Access code returns Domain objects directly these are no longer needed to move data into the rest of the system. In the cases where the mapping from the database to objects is not complicated these DTOs/Entities/DataModels have become superfluous and can be deleted. This can turn out to be a lot of code that can be deleted. The major downside here is that the endpoint code has been given slightly more responsibility, since it now has to fetch Domain objects - which it also did before - and also has to save them again after interacting with them. Depending on the state of affairs before breaking the Domain to Data Access dependency the endpoint may or may not have had to explicitly save changes. That may have been handled by a combination of dirty tracking and infrastructure code. In the 4th post of this series I will show a way to remove this extra responsibility from the presentation layer again.